After three years of work One Day Soon is finally here. Today (Oct 7) is my fathers birthday. People who purchased the physical CD will read in the (32 page hand-written) booklet that I dedicated this album to my parents. Without them there would be no me, so who better to dedicate it to. My mother (Claire Prieto) and my father (Roger McTair) have been my two primary supporters in my mission to be some kind of an artist since I was a toddler. My parents took me to art classes, music classes, came to my shows and poetry readings (in some sketchy places sometimes) spoke to me about my plans and supported my vision. My parents are artists, filmmakers, and have always supported the arts and culture, taught me the importance of being involved in community, the importance of learning and teaching at the same time and the importance of honesty, perseverance and dedication. My parents worried about money but fought for a more important goal. In the next few months I will start to post digital versions of documentaries that my parents made, you will probably understand me better then. Thank you to everyone who has supported this process. 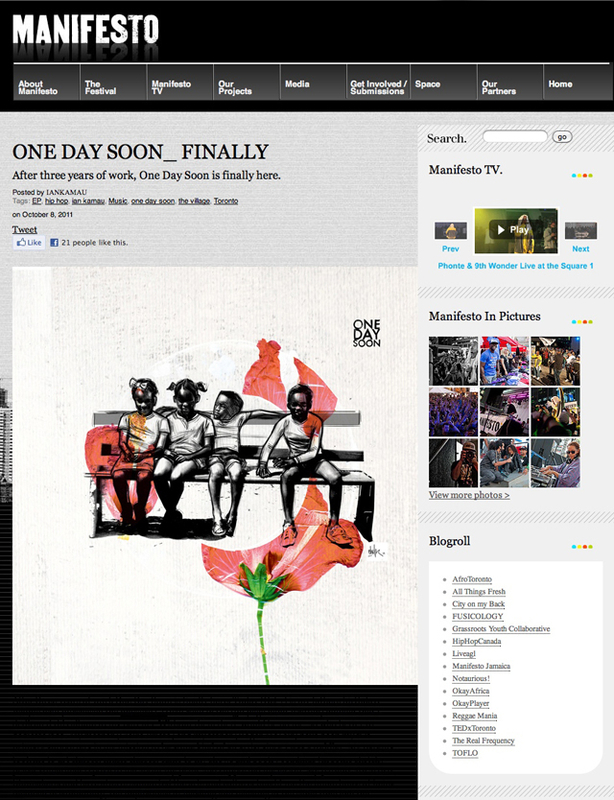 One Day Soon was inspired by my community, from my brother N’dichu in Nairobi who opened his door for me the first time i visited the continent of Africa (Nairobi, Kenya) for the first time, Tumi who did the same (Jo’burg South Africa), Mediza’s family in Accra, Ghanna who also did the same, to El tipo and Magia in Cuba, to Gillian, Giselle, Michael, Lamar, Javar, Sheldon, Kyauna and Pablo and everyone who came in to Artistic Effusion who reminded me why I did music in the first place (‘AE reminded me I was an artist’) and every person in Toronto who has pushed me, showed interest, challenged me and supported me to make this happen. This is really supposed to be the beginning of the process, we will see what happens. #onedaysoon. One Day Soon is available HERE/Now.. please pass along the sampler and the download link if you enjoy/want to help (thanks) this project is independent, a labor of love, I really need your help to push it forward and keep it moving, anything that you can do to get it into the ears of people, press, other artists or whoever would be so appreciated. I’m at a place right now where without balancing this time with investment it will be difficult to continue, so if you appreciate this, tell someone and help me build the tribe around it.